The most personal device Apple Watch is a Bluetooth-enabled smart watch, so inherently it can works with all compatibles iPhone (iPhone 5 and later). The Apple watch very rely on iPhone, since its wonder features user cannot use without iPhone. So, off course if you would like to Switch Apple watch with all available contents. For that, you must follow some essential instructions before to do it. So if you right now want to switch Apple Watch then this article will let you learn easy to change iWatch from your old paired iPhone to new Apple iPhone. Step 1. Stop backup for Apple watch to your old iPhone and then erase your Apple watch. After that, you will become eligible to pair it with your new iPhone; at other side, make ready your new iPhone to pair with Apple watch. Because without paring Apple watch can’t work. Step 3. Take iCloud backup of your old iPhone and then transfer all your content to your new iPhone. If you take backup using iTunes, then don’t forget to encrypt your backup to save your Activity and health content. Step 4. Still you are on at last point means now pair your Apple watch with your new iPhone. When you’re asked, choose restore from backup, then select the most recent backup to transfer your content and backup your Apple watch. Please Note: if you don’t have old iPhone or take backup then you should erase your Apple watch and then Pair it with your New iPhone. 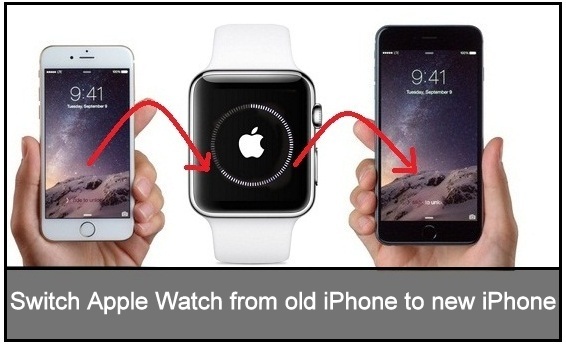 Let give us a feedback about on to switch Apple watch to a new iPhone from old iPhone. Any trouble or having a question please send it in the comment box.